A middle aged volunteer wearing an army jacket, blue jeans, white baseball cap and red gardening gloves sits on a wooden bench. Hundreds of articles have been written about the 53-year-old man who brutally murdered Batley and Spen MP Jo Cox, but this image was one of the few photographs to have emerged before the trial. Thomas Mair, pictured when he was volunteering at Birstall's Oakwell Hall. It shows Thomas Mair around six years ago when he spoke to local media about his history of mental health problems and the positive impact of volunteering at Oakwell Hall Country Park. ‎By this time, Mair was living alone on Birstall’s Fieldhead Estate in the semi-detached home which he had shared for most of his life with his late grandmother. You would never think he was like that, ever. Mair's home in Lowood Lane, which has been boarded up since June. It was, by all accounts, a life largely spent in solitude. On the night before his fatal attack on Mrs Cox, Mair had called in at Birstall Wellbeing Centre. Centre manager Rebecca Walker, 43, said: “It was the first time he had actually been in. He said he passed the centre on a daily basis so he obviously had a route he walked into Birstall. The centre in Gelderd Road was busy at that point with lots of people arriving for one of the regular sessions. “He didn’t want to join. He wanted something more on a one-to-one basis,” Miss Walker said. Mair left shortly after, saying he would return the next day around lunchtime. “Of course, he never called in,” Miss Walker said. “It was only in the evening when I had seen it on social media that the penny dropped. You just go into a state of shock then. Neighbours in Lowood Lane spoke without exception of a quiet, but not unpleasant, man who shied away from conversation with most. Katie Green lives in the adjoining semi-detached home with her husband and three young children. After 13 years as his neighbour, she knew virtually nothing about Mair. “He would say ‘hi’ if he was in the garden but he wouldn’t stand and have a conversation with you,” she said. David Thomas, 60, lives in a house on the opposite side of the street. Although his mother, brother and half-brother are all appear to live in neighbouring towns, they were not regular visitors to Mair’s home. Neighbours talked about Mair mowing the lawns of elderly people on the street and there have been suggestions he had also volunteered at a special school. 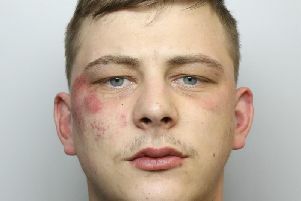 It emerged during the trial that he made regular visits to the library in Birstall, outside which he would eventually go on to shoot and stab mother-of-two Mrs Cox. She said he visited the library around once a week and came into Birstall Library on the eve of the murder to use a computer. “As far as I know, he only accesses the IT services and I can’t remember him getting a book out,” she said. Mrs Cox had represented the Batley and Spen constituency for ‎just over a year and there has been nothing to suggest she ever came into direct contact with Mair. Witnesses said they heard Mair shouting “Britain first” or “Britain First”, prompting speculation from an early stage that the killing was politically motivated. In the days that followed the attack there were reports of correspondence with far-right publications, the purchase of books on how to make weapons, and claims that Mair was known to the FBI as a political activist. A picture, apparently showing Mair at a Britain First event in Dewsbury earlier in the year, also surfaced. The group was quick to distance itself from Mair, saying that they did not condone his actions. And in media interviews at the time, both his brother and half-brother said he had not been a politically active person or talked to them about his political beliefs. Yet the court would go to hear that Mair spent time online visiting far-right websites and had Nazi material in his home. Born in Kilmarnock on August 12, 1963, Mair is the son of James and Mary Mair. It is understood the family moved to West Yorkshire while he was still a child, and he was raised largely by his grandmother at the house in Lowood Lane. Mair shared the home with her until her death and he has been the sole occupant of the council house since August 16, 1996. Neighbour Mr Thomas told the court that Mair’s brother, Scott, had lived at the house at one time. It is unclear whether Mair’s father is still alive but his mother now lives in Batley under the name Goodall. Mair also has a half-brother, Duane St Louis, whose late father was originally from Grenada. But the 43-year-old previously told reporters that his half-brother had suffered from obsessive compulsive disorder. He said it manifested as an obsession with cleanliness and Mair had been known to scrub himself with Brillo pads. However, 49-year-old Scott Mair told reporters that his brother had been treated for his mental health problems. He said his brother was not a violent man and was not particularly political either. Mair previously attended Pathways, a service run by South West Yorkshire Partnership NHS Foundation Trust. And it appears that it was through this scheme, rather than the Friends of Oakwell Hall, that Mair came to volunteer at the country park on the edge of Birstall. Neither the council nor the health trust was willing to discuss its past or present contact with Mair. His home, which was a hive of police activity in the days immediately after the murder, is now boarded up. Mrs Green said: “It was the scariest thing I’ve ever been through. My boys were at school and they had it on lockdown. “All these big men were masked up and told us to get inside. They had the house all surrounded with guns. Mrs Green later had to put up blinds in her living room window because of the people coming by to stare at her old neighbour’s property. Months later she still finds it hard to understand how the quiet man she had lived next to for so many years could have committed such violence.